The Fiber One line from General Mills has been on a winning streak. Last year, they came out with a very satisfying toaster pastry and one of the best new pancake mixes to be introduced by a major brand in years, Fiber One Complete Pancake Mix. With their new Fiber One Frosted Shredded Wheat cereal, their winning streak is over. This new cereal is a dud. This cereal is a substandard reproduction of Kellogg's Frosted Mini-Wheats Bite Size cereal. Fans of Kellogg's Frosted Mini-Wheats appreciate the initially crunchy and not-too-heavy texture of the strands of wheat coupled with a delightful, if somewhat plain, sweet frosting. It's a simple cereal, and you'd think it'd be easy to recreate the elements that make it good. Unfortunately, Fiber One Shredded Wheat is dull and almost frustrating by comparison. The whole-grain strands are tough and chewy. The sweet frosting is more like powdered sugar and feels like an afterthought. As far as fiber goes, this new Fiber One cereal has 8 grams of dietary fiber compared to Frosted Mini-Wheats' 6 grams of fiber - not a real dramatic difference. I'd avoid this cereal... but seriously, give that Fiber One Complete Pancake Mix a try... it's so good. What do you think of Fiber One Frosted Shredded Wheat? 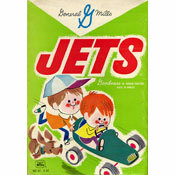 Love this cereal but can't find it anymore. Please bring it back! I don't know what half of these reviews are talking about. This stuff is awesome. Taste the same to me. I love this cereal and it tastes soooo much better than Kellogg's. Eat it pretty much every day and have done so for a year or more. Still like it a lot. I completely agree, I bought a box of Fiber One Frosted Shredded Wheat and was initially excited about it because I love Frosted Mini Wheats. After I placed the fiber one shredded wheat on a bowl, it turned into a ball of mush, was really disgusting. The cereal lost its consistency once placed in milk as well as taste. I love this cereal. It tastes great. The pieces are not as big which makes it easier to eat. I can eat an entire bowl of this stuff quickly and it leaves me wanting more. This is straight-up garbage and a waste of money. I bought this thinking it was frosted mini wheats then realized it wasn't. I assumed it was the wrong. It gets mushy once in milk and tastes weird. I usually love shredded wheat and frosted mini wheats but I have no idea what turned me off about the cereal.... the texture is awful and after the first bowl I felt nauseous and vomited it all up. I hate this stuff.... It's too tough. The author's review is biased. I think this cereal tastes better than Frosted mini wheats. I like both. Very yummy. The sugar is a little high, but tons of fiber. I liked it a lot. I sometimes eat it as a snack instead of eating potato chips. Much better! I eat this every morning and love it!!! It has a wonderful taste, is good for you, and fills you up! I disagree. I like this cereal better than Kellogg's Frosted Mini Wheats. I considered Frosted Mini Wheats as one of my favorite cereals, but I was always disappointed that there wasn't enough sugar and that the milk never tasted different after I'd eaten all of it. With the Fiber One kind, the sugar-to-wheat ratio is spot-on, and the milk actually tastes sweeter after everything else is gone. Plus, you can't go wrong with adding more fiber to the cereal. 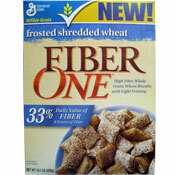 Fiber One's variety replaces Kelloggs' with me. I tried this cereal... I thought it was a little too slimy for me. If I actually thought about the texture/taste while eating, I'd probably gag, so I try not to think about it while eating it. Think I'll stick with the tried and true Kellogg's Frosted Mini Wheats. I just ate a bowl and its not bad for a frosted shredded wheat cereal with a lot of fiber. This cereal tasted stale immediately after opening the box. There's something about the way they processed it and made it into shredded wheat nuggets that makes it dry, chewy and with an odd aftertaste. Stick with the original Shredded Wheat - I recommend the Blueberry Shredded Wheat!